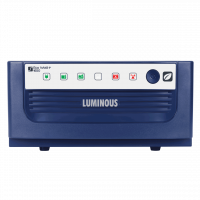 The Luminous Sine Wave Inverter - 1050 VA is an essential appliance that provides reliable performance during power-cuts. It stability protects sensitive equipment from damage caused due to rapid changes in input power supply. This inverter boasts of pure sine wave output. The implementation of adaptive battery charging control technology prevents overcharging of the battery. One of the unique features of this inverter is that it can endure high load cold start. To Recieve updates and possible rewards for Luminous Eco Watt 1050VA Inverter please sign in. To Recieve updates and possible rewards for UPS & Inverter please sign in.